Although not exactly beside the sea, the course clearly comes under its influence, and the wind is a key factor when playing here, just as much as the difficulties of the layout and the hazards. The course's very respectable length also has to be considered, even though the fairways often roll a lot and make the water hazard more dangerous in the process. 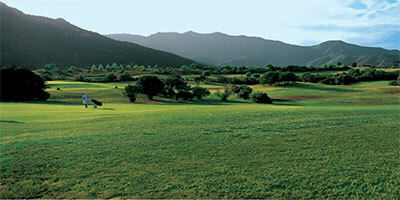 Designed by British designers Cotton and Pennink, the course was actually built under the supervision of the late Piero Mancinelli, one of the great Italian course architects of our age. A well-balanced layout, Is Molas has successfully hugged the contours of the terrain and retained its very natural appearance between the sea and tree-covered hills. 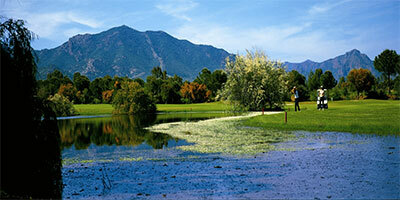 Spectacular and original, the course is at once pleasant to look at and exciting to play. 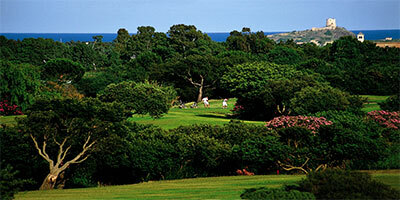 For non-golfers, there is all the fun of the seaside just next door. Nine holes of a planned second course are now open, making this an even more attractive site for golfing. The Province of Cagliari is situated in the southern part of Sardinia, overlooking the Mediterranean Sea on the south and on the east. It is bounded by the Provinces of Nuoro, Ogliastra and Oristano on the north, and by the Provinces of Carbonia-Iglesias and Medio Campidano on the west. It expands over 1,764 square miles (19% of Sardinian territory) and comprises 71 municipalities, including the City of Cagliari, capital of both the Province and the entire Region of Sardinia. Like the rest of the island, the Province of Cagliari is of rather heteregoneous terrain: the variety of rocks is remarkable, as are the minerals, the highlands, the caves and the coasts. The Molentargius-Saline Regional Natural Park, in the inner part of the province, is a rare example of an ecosystem in highly anthropized areas. It is one of the most important places in Europe for the extraordinary number of birds that shelter here. One-hundred-seventy-seven among 330 of Sardinia's birds species live in the Molentargius Basin - more than a quarter of all European bird species. At certain times of the year, these can exceed 20,000 specimens. Among these: flamingos, herons and little egrets. The park borders with one of Italy’s most ample beaches, the Poetto, extending over almost five miles, and Cagliari's main beach. Next to the Capital is the Sette Fratelli – Monte Generis Regional Park, one of the largest parks on the island and a natural environment for the Sardinian deer. The Sella del Diavolo’s Promontory is also here - its name derives from the legend that Lucifer carved the profile of his saddle on the rock after being expelled from Paradise. The eastern part of the Province is made up of the subregion of Sarabus-Gerrei, subjected to considerable drainage works at the beginning of the 20th Century in order to eliminate malaria: it is a wild zone, yet still abundant with characteristic villages. The Province of Olbia-Tempio opens up to the Sea of Sardegna (a narrow channel that separates the island from Corsica) to the north, and to the Tyrrhenian Sea to the east; it borders with Sassari Province to the west and with the Province of Nuoro to the south. The province was established recently, thanks to a 2001 regional law that included a new subdivision of the Sardinian territory, doubling the number of provinces from four to eight. The area has a surface of 2,111 sq mi (14.1% of the total) and includes 26 municipalities - Olbia and Tempio Pausania among them - as well as the Maddalena Archipelago, now a geo-marine national park. Part of the historic Gallura territory, on the island's northeastern side, composes a section of the province, from the Coghinas River to Monte Nieddu in San Teodoro (with the exception of Viddalba and Erula), maintaining the Limbara range as a border on its south. The land expresses itself via several different environments - sea, plains, hills, mountains, cultivated fields and desert areas. One of the unique elements rather evident in Gallura are the granite rocks, sculpted into extraordinary natural sculptures by the wind and the rain. Several oak forests fill out the landscape; from them cork (locally named ‘soft gold’) is extracted and used in a number of ways. And for the archaeology enthusiasts, traces of the pre-Nuragic, Nuragic, Punic, Roman and Medieval civilizations still remain today. Another distinctive feature is the presence of scattered rural settlements called ‘stazzi’, small family-owned, agro-pastoral activities originally established by shepherds in the 17th-18th Centuries. Flourishing until very recently, the stazzi were progressively abandoned as people moved to the cities due to increased tourism over the last few decades. This phenomenon hit the area surrounding Arzachena in particular, inhabited only by a few farmers and shepherds even up until the mid-20th Century. In 1962, the Arab Prince Aga Khan IV decided to embark on an exceptional touristic and real estate endeavor with the creation of the ‘Costa Smeralda Consortium’, taking advantage of the natural beauty of the area to make it a paradise for high-budget tourism. 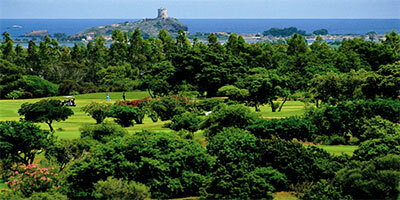 Today, this part of Sardinia is one of the most exclusive destinations not only in the country, but in the whole world.